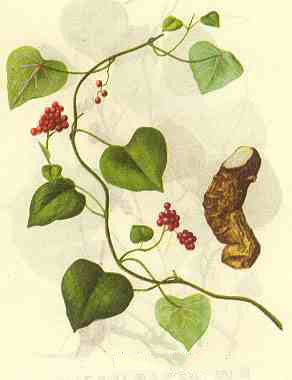 The drug is the root of Aristolochia heterophylla Hemsl. (family Aristolochiaceae), growing insparsewoods of hillside scrubs, and distributed in Hebei, Shaanxi, Gansu, Hubei, Hunan, Sichuan, Yunnanand Guizhou of China. Pungent, bitter, cold; bladder, spleen and kidney meridians entered. It is used to induce diuresis, subdue swelling and relieve rheumatic condition, reduce blood pressure; for the treatment of edema, dribbling and painful micturition, tinea pedis, rheumatic arthralgia and hypertension.